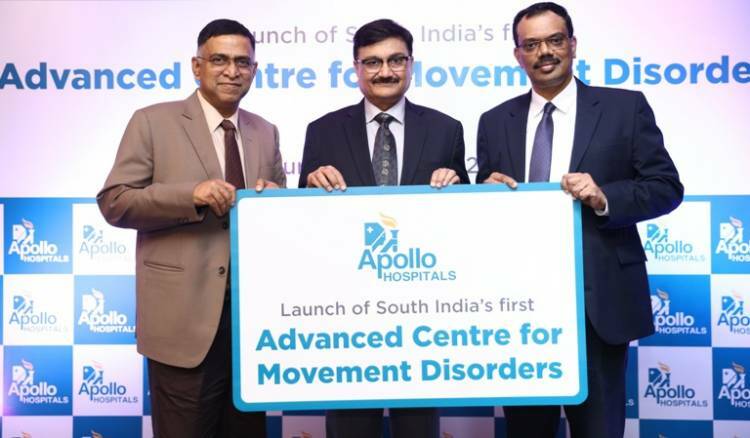 Chennai, 11 April 2019: Apollo Hospitals, Asia’s largest and most trusted multi-specialty chain of hospitals became the first hospital in South India to start a fully functional advanced centre for Movement Disorders. The centre was launched in the presence of Prof. (Dr.) Paresh K. Doshi,Group Advisor, Functional Neurosurgery, Apollo Hospitals. The comprehensive centre will offer 360° care with the most advanced forms of medical and surgical treatment and ancillary services to patients afflicted with various movement disorders including Parkinson’s diseases. Prevalence of Parkinson’s disease in India is around 300-400 out of 100,000, which is expected to multiply by 2030. Parkinson's disease is a chronic disabling neurological condition affecting people who are 60 years and above. When 80% of cell loss occurs in brain, the first symptoms of Parkinson's disease appear. Usually Parkinson's disease is manifested by tremors affecting initially one side of the body and later on both sides of the body, slowness in movement, change in handwriting, alteration in voice, get and balance disturbances and rigidity. Apollo Hospital’s Advanced Centre for Movement Disorder offers Deep Brain Stimulation Surgeries and other similar services to treat a wide spectrum of diseases such as Parkinson’s disease, Cerebral Palsy, Dystonia, Essential Tremor, Intractable Spasticity dyskinesia, depression and chronic pain among others. DBS is the advanced treatment option available for Parkinson’s disease with motor fluctuations and side effects from medicine. USA FDA has approved this now to be offered early in the disease progression rather than waiting till the end. This has enabled to not only improve the quality of life but also regain dignity and self-esteem of the patient. DBS involves placing of an electrode in the Sub Thalamic Nucleas, which is adjacent to Thalamus, an important relay station of the brain. The electrode sends continuous electronic pulses through a battery, which is attached in the chest wall and can be externally controlled through a remote control. There is no definitive preventive strategy for Parkinson’s disease. Healthy life style and early diagnosis are helpful in disability limitation and care planning. There are reports from large epidemiological studies suggest that a few life style factors provide protection against the disease. However, these are not recommended for prevention of Parkinson’s disease.